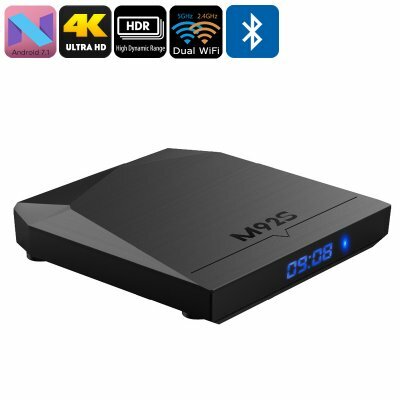 Successfully Added M92S Android TV Box - 4K Support, Android 7.1, Google Play, Octa-Core CPU, 2GB RAM, Miracast, Dual-Band WiFi to your Shopping Cart. With the M92S Android TV Box, you’ll bring hours’ worth of fun and entertainment into your household. This 4K TV box allows those of you who own a 4K TV set to watch your favorite films and series in stunning Ultra-HD resolution. Never before have you been able to enjoy your media in such detail and color. Simply connect it to your TV set and you’ll be able to browse the web, play games, and watch movies. With access to Google Play and Kodi TV, you’ll have an unlimited amount of free entertainment at your disposal. This 4K TV box runs on the latest Android 7.1.1 operating system. This will provide you the possibility to enjoy the latest software available. Additionally, it brings forth a smooth and lag-free user experience. This lets you fully enjoy all the great features your Android TV box has to offer. The 16GB of internal memory offers plenty of space to store all your downloaded files. If this is not enough, you’ll be able to slide in a 32GD SD card slot. With this much storage at hand, you’ll never run out of space to save your games and media. Additional features such as Miracast and Bluetooth 4.1 will further enhance your user experience. This Android TV box is sure to meet all your entertainment demands. Packed within its stylish body you’ll find the Amlogic S912 chipset. This Octa-Core processor has been clocked at 2.0GHz and brings along a powerful performance. Along with its 2GB of RAM, it lets you tackle the most demanding media. Additionally, this 4K TV box also packs the ARM Mali-T820MP3 graphics’ unit. This piece of hardware allows you to enjoy high details and vivid color when engaged in your favorite games or media. With Dual-Band WiFi support, this 4K TV box lets you browse the web at any time and download files at lightning speeds.